NT Connections at Derby Theatre. Bilborough College and New College Nottingham. – East Midlands Theatre. There is a theatrical debate that considers whether young people are the theatre goers of the future or the theatre goers of the present. As their theatre education; their theatre going and their theatre performing passions are very much set in the ‘here and now’ East Midlands Theatre believe that young people are the theatre goers of the present. Why wait until some mythical tomorrow to enjoy top class theatre? Get engaged now! 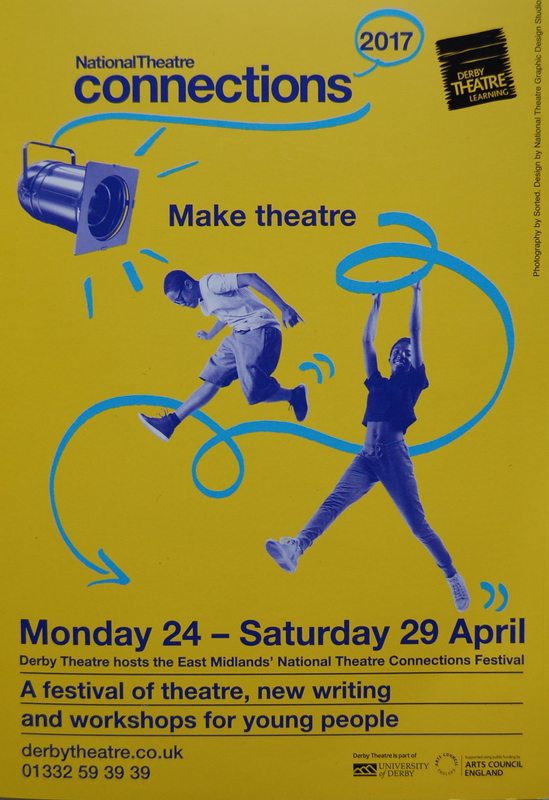 With this ethos in mind we look now to the National Theatre Connections Festival and the role that East Midlands host ‘Derby Theatre’ plays in exciting the young people of today in the theatrical arts. 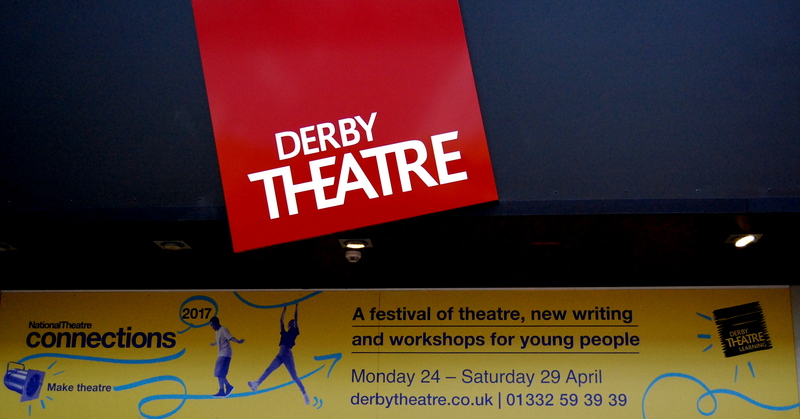 Derby Theatre say: ‘Each year, The National Theatre ask ten writers to create new plays for performance by young companies all over the country and we are thrilled to be welcoming 12 talented young companies in the region to perform at our festival. Over the jam packed 6 days young people will get the chance to see great theatre, listen to live music and take part in lots of fun and lively workshops.’ Click this Derby Theatre NT Connections LINK to discover the full programme 24th – 29th April including a Saturday full of great workshops for young people with professional actors. 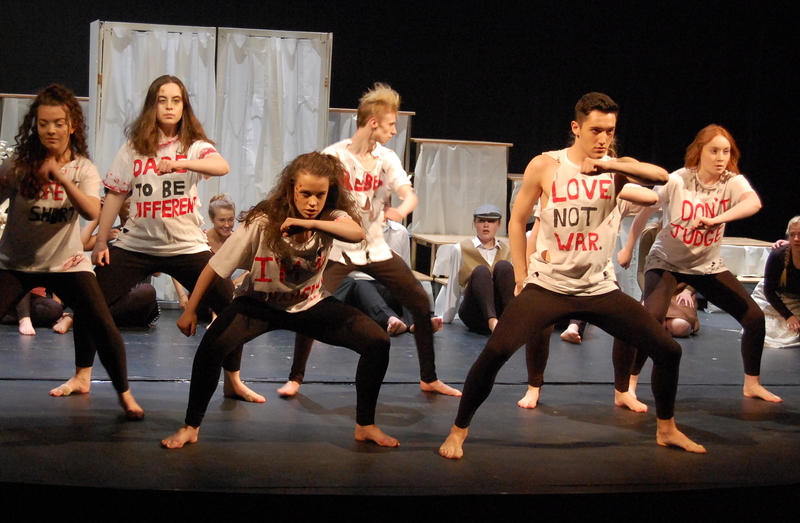 East Midlands Theatre’s founder and theatre reviewer Phil Lowe pops over to Derby on the first day of the festival to check out two of its main participants: Bilborough College and New College Nottingham. Bilborough is performing The Monstrum by Kellie Smith and New College Nottingham is performing Musical Differences by Robin French. Upon arrival Phil finds that both sets of students are in the 16-18 age range and both groups are very mature and disciplined in their approach and respectful of the teaching staff and the great chance to perform at a major theatre. The two groups are over twenty students strong and we discover that both groups are very keen to see what the others have to offer after all their separate technical rehearsals are over and the audiences are invited in to the evening performances. Each group will have a chance to watch the other in real life performance terms. The rehearsals and note giving sessions are led by each college’s core teaching staff. These young people are now existing in a professional environment with the long day rehearsals and post performance times prior to performance. Stamina and patience are paramount for all. The NCN students go on to explain that when they first performed Musical Differences they had some feedback that showed that the audience was sometimes confused as to who was playing who. This was because various people were playing different aspects of a group of characters. They explain that some further work was needed in the stage direction and defining the characters as they appear on stage. Some of this was done by spotlighting; some by declaration of character name and other work on actor placement within the playing area and using the space creatively. Students Asniyn and Drew further explained their advancement on character focus by saying that they learnt to focus on aspects of physicality and that all the cast learnt to ‘own the play’ by co-directing certain smaller scenes. In doing all these things the production of Musical Differences became a clearer and more theatrically exciting piece. Phil spends some time observing the Bilborough students rehearsing The Monstrum on the main Derby Theatre stage and is impressed with the teenagers’ professional behaviour. This is particularly true during some new directional decisions and cast groupings happening as the larger stage is taken into consideration. Creating lit atmosphere with a much bigger lighting desk brings its own sense of excitement and achievement. Once the full run dress rehearsal gets under way some excellent acting is shown by the whole Bilborough ensemble. The NCN students are gathered for their ‘notes’ by their course leaders. These are to alert the students to aspects of their performance that are well done and also instructions for improvement ready for their evening performance. The advice was centred around being in character all the time and being aware of how one reacts with the other character whether in direct conversation with them or observational. Even if they are doing very little on stage they should be taking in what is being said by the other actors. If they are taking note of the action to the observer it is really noticeable. As a general note the tutor makes the students aware that some of them are starting their lines full power then drifting off towards the end of the speech. The energy at the end of the line needs to be as relevant and as truthful as the energy at the beginning of the line. Projection and diction are very important as even little flaws in diction are really noticeable on stage. Finally the student actors need to be aware of where they are on stage in relation to someone else as the Derby Theatre stage is a lot deeper than the NCN students are used to. The relief of stage congestion is examined as a thing that the students need to be aware of as well as being given more individualised and positive learning advice about their stagecraft. Throughout the festival other groups such as Chapter 4, Flying High, Creative Learning Stoke, Walton Acting Company and Tiptoe will be having similarly exciting theatre experiences with their own productions of The Monstrum, Fomo, Extremism, The School Film, #Yolo and Zero for the Young Dudes! Do check out the earlier link and support this fantastic festival for young people who are the inspiring young student theatre practitioners and audiences of today – not tomorrow.